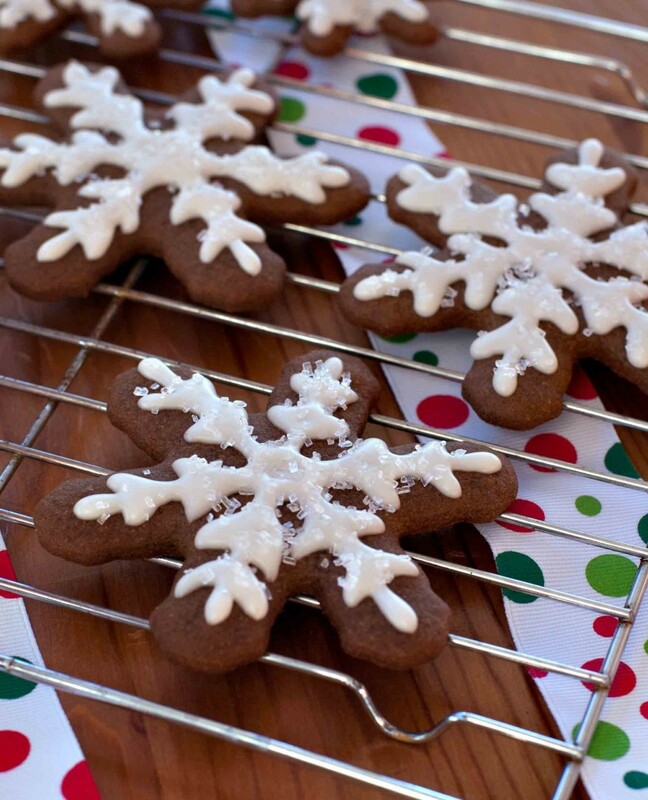 These festive gluten-free gingerbread cookies are vegan and free of corn, dairy, nuts and soy. Place the flour, starches, guar gum, baking soda, sea salt, spices and brown sugar in the bowl of an electric mixer fitted with the paddle attachment. Mix briefly to combine. Add the molasses and oil and mix on medium-low for approximately 1 minute or until you have a damp, sandy mixture. Starting with 2 tablespoons, add the milk substitute and mix on low speed until a dough forms. If the dough seems dry, use the remaining 2 tablespoons of milk. Wrap the dough with plastic wrap, mold into the shape of a disk and refrigerate for 1 hour or overnight. Working with small portions, roll out the dough between two sheets of plastic wrap sprinkled with granulated sugar, to ¹⁄8-inch thickness, about 3 inches across. Cut out desired shapes and transfer to parchment-lined sheet pan with a thin spatula dipped in a bit of gluten-free flour. Bake in the center of the oven for 8-10 minutes depending on the size and thickness of your cookies. Cool on the cookie sheet for a few minutes, then transfer to a wire rack. Frost, if desired, and serve. For the icing: In a small bowl mix the powdered sugar, milk and lemon juice until smooth. Adjust to your desired consistency by adding additional milk or a bit more powdered sugar. *Wholesome Sweeteners brand Organic Powdered Sugar is made with tapioca starch instead of cornstarch. Always double-check labels. Nutrition Analysis (per cookie, with icing and coconut milk as milk substitute): 110 cal, 3 g fat, 0 mg chol, 65 mg sodium, 19 g carbs, 1 fiber, 10 g sugar, 1 g protein.